At this page you find tools for creating disc images of your old Acorn Discs. Before the download starts you need to choose the right tool for your system. If you are running your computer with Windows 95, 98 or ME you should download ArcDisc. 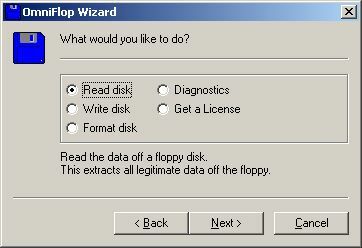 If you are running your computer with Windows NT, 2000, XP or Vista you should download OmniFlop. OmniFlop is a 'universal' floppy disk reader, writer, and tester for the IBM PC or compatible which can handle alien floppy disk formats not normally supported by DOS, Windows and Linux. If you need more specific information please visit the homepage listed below. Click here to visit the homepage of OmniFlop! ArcDisc is a frontend to the popular program 'arcimg', that runs in DOS or the DOS-Mode for Windows. ArcDisc is intended to make the work with arcimg easier and faster. ArcDisc is FREEWARE and runs quite sure on Windows 95 and Windows 98.Because of the limited hardware access given by some Operating Systems it won't run on Windows NT, Windows 2000 and Windows XP. All downloadable zip-files include the main program ArcDisc, the tool 'arcimg' and a readmefile, so you can start right away after the download. If you have any suggestions, problems with the program or you just want to tell me, how nice this tool is, then please mail me ;-). I also want to know, if the program works fine on your Windows-System or if you have some problems. If you like this tool, tell it to your friends. Thanx! If you're interested in using arcimg standalone (without my frontend?) and don't know how, look at the Links-Section in the subsection Acorn Emulation to find the home of arcimg. There are no really new feature at this version, but many things have changed and ArcDisc became a big roundup of current functions. The user interaction is better and more error tolerant. There are also some things, that were changed after some error messages of users. Thanx for sending me this. After a long time of searching for the last problem at this version it's finally done. Here is the new version. One word to the problem: It seems to be a problem with different versions of arcimg, so please use the one inside this package. The first version that supports full functionality for arcimg. A improved version of ArcDisc. Major update is the use of a ini-file for serializing paths. The first public release for ArcDisc. At the moment there is only a small functionality. ADFimager is the creation tool, that runs under RISC OS. It's as easy as RISC OS itself, so just try it. This utility can read/write the contents of ADF disc images on Acorn machines. It consists of two programs, a Frontend and a Backend (that can be run independently). Use it to create disc images of your discs on the Acorn and read them on the emulator. Click here to visit the original download page! Get all tools on CD! If you don't want to download all that stuff you can buy Wocki's Acorn Emulation CD. Visit my shop to get more informations.